If you don't think you want to see this movie, think again. You'll bop your head, cringe and even tear up during this biopic of the first gangster rap group, N.W.A. The 5 members hailed from Compton, CA during the late 1980's, when being an African American male in Los Angeles was not the easiest thing to be, to put it lightly. I had no idea how horribly these men were treated, and the discrimination they faced. It's very timely that this film came out now, with all the disturbing racial turmoil we've been hearing about in the news. Besides the harsh realities the film reveals, their's is an incredibly engaging story. For a rap fan, I was in it every single minute. Non rap fans will still appreciate the history and drama. It's not to be missed. You've likely heard of 1 or 2 of the artists that comprise N.W.A: Dr. Dre, Ice Cube, Eazy-E, MC Ren and DJ Yella. From the moment we meet each of these men, we're introduced to the problems and roadblocks that stand in their way of making it out of the streets: drug dealing, guns, thugs - these are just a few of the daily occurances. As Ice Cube put it, "our art is a reflection of our reality." O'Shea Jackson, Jr. is Ice Cube's son in real life and brings a calmness and grace to the screen in portraying his father. Eazy-E quickly rises to the front of the group, catching the eye of sleazy but seemingly good-hearted manager Jerry Heller, played expertly by Paul Giamatti. We are under the impression that his intentions are true, only to wrongly fall for him like the members of N.W.A. All but one, that is - Ice Cube's skepticism leads him to a solo career, followed shortly after by Dr. Dre. These two ultimately have the most mainstream success. Corey Hawkins brings a charm and quiet strength to Dre, while Jason Mitchell's Eazy walks and talks bigger than he is, and seems to have the most street smarts and strongest backbone, while also showing vulnerability. 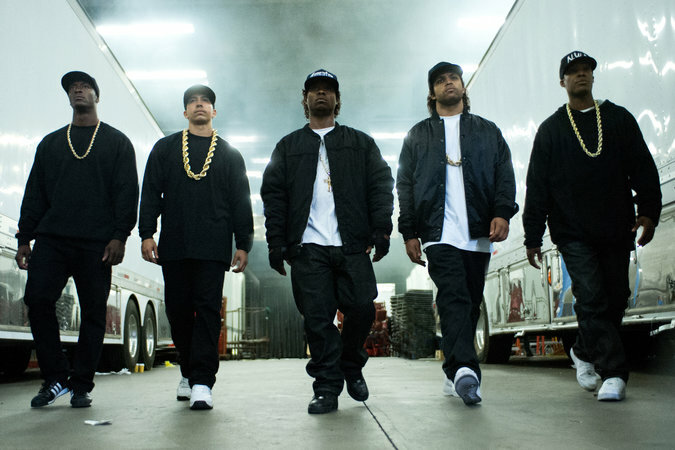 What these men brought out of Compton and into the world is remarkable. What they went through to be able to write and rap about such extreme and violent topics is also outrageous. 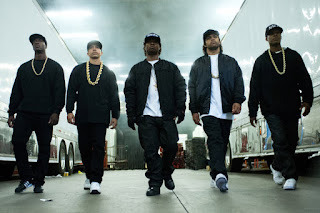 "Straight Outta Compton" does their story justice.